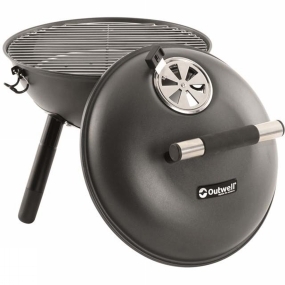 The Calvados Grill from Outwell is for those that love that fresh, smoky flavour you can only get from a charcoal BBQ. You get a more even heat as the lid reflects back on the food so it gets cooked from all sides letting you get stuck in quicker. With its large cooking surface, you can cook anything from sausages and burgers up to steaks and even whole chickens. The built-in air vents let you control the temperature even more so you can make sure it is cooked to perfection. When it's time to pack up, the legs can be stored inside and there are clips to secure the lid so all that is left to do is grab the handle and go.